June 7,2014- Had a 3/4 charter with Stefan. Weather was warm and had a nice outgoing tide working until 11:43am. He wanted a nice fish dinner and the fish did not disappoint. We started with some pan-sized porgies and then the action took off when a feisty barracuda blew-up our live-lined pinfish. We then tricked a territorial red grouper off the reef and hooked numerous grunts until the tide slacked. All in all, Stefan was pretty satisfied with his catch to share with his family. Enjoy Stefan! 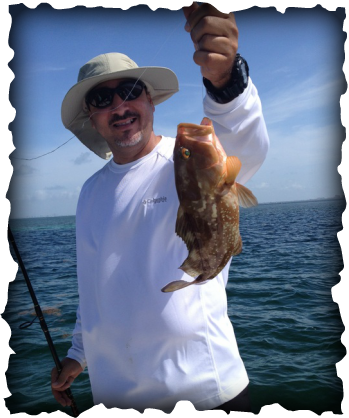 June 14,2014- Had a half day charter with a very nice couple Lazaro and Paula. We had incoming tides and wanted to catch the bite from 8:20am to about 10:15am. Sea conditions were picture perfect and light winds. 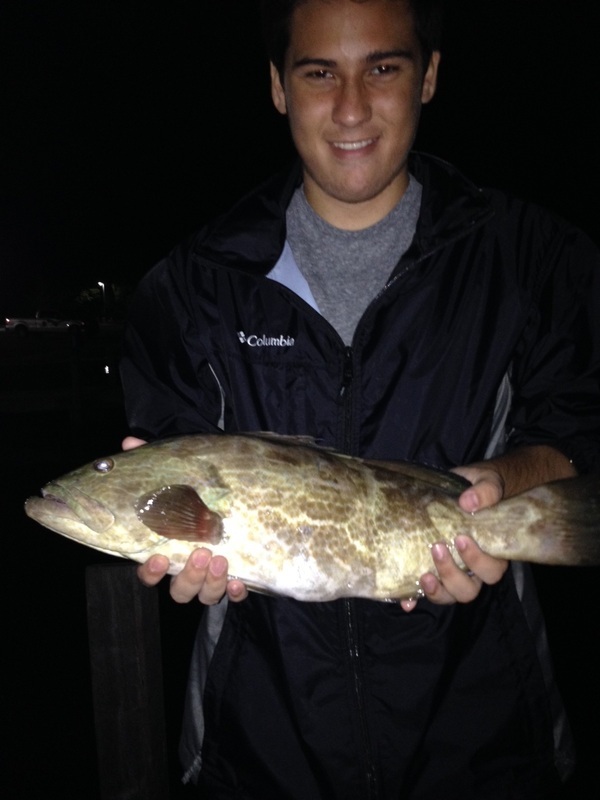 The fish on the reefs stubborn due to the full moon but we made the best of it.. Ya see, a full moon have these fish eating all night long (think of an all you can eat buffet!) but then our luck turn better when Lazaro hooked up with a nice cuda showed up- he actually was trying to steal Paula's nice yellow-tail snapper! 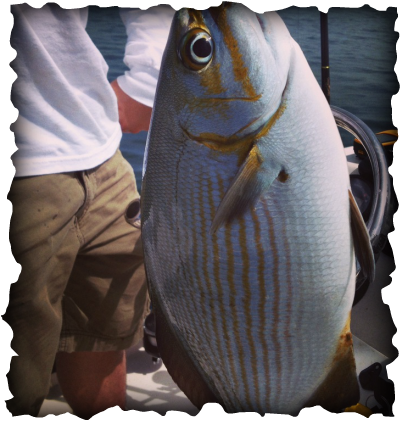 We quickly pitched a pinfish and it was game one! We also caught decent porgies, red groupers -(on the small side) but the grunts had the feed-bag on. I have night trips available for tarpon and snook so don't bashful.. take care and tight lines always!! Feisty Barracuda who attempted to steal his girlfriends yellow-tail snapper. Lazaro to the rescue! Aug 15,2014 -Wow! Its been a long time since I updated my reports page! Please accept my apologies for being to busy fishing instead of updating! LOL! Since my last post, the fishing action for my clients has been hot but the weather even hotter! We caught many varieties of snapper, grouper, bar-jacks (yellow jacks), big barracuda's, nurse sharks (not the toothy ones) and many others. The key is to get to the grounds before mid-day, because once midday hits- the bite kinda dies down. Will try to post weekly- enjoy the past months pictures! Sundays trip was a memorable one!- I had Joe and son onboard and I wanted to repeat the same magic. Well, I repeated the fish action and then some! Joe and his son were onto fish all day. The highlight of the day was my backflip off the port side.. Had left a fishing pole that I was working on but then had to net a big fish. When I went back to the rod, lost my footing and spash!! Still makes me crack up everytime I think about it.. Enjoy the pics and tight lines! 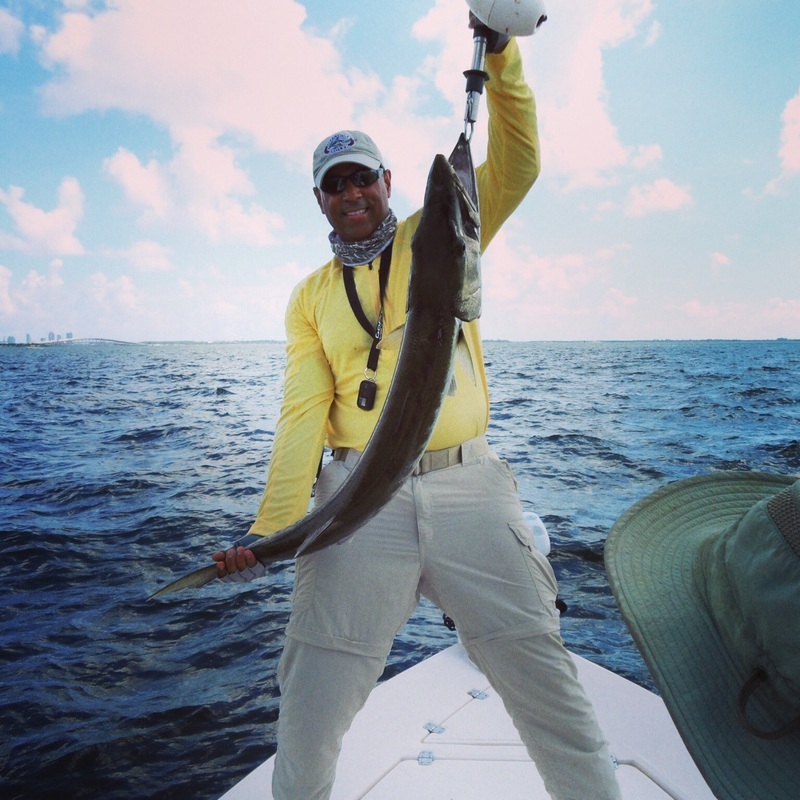 Week of Aug 18, 2014 Had afternoon charter that probably was one of the best charters in terms of quality and quantity. 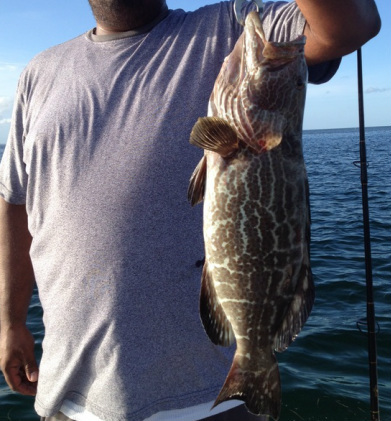 We hit a nice black grouper, the yellow tails were blowing up any bait offered and constant action from the cuberas / mangrove snappers.. Ofcourse- we can not leave out the bermuda chub making their presence known. Sunday- had the wife and friend Girsi aboard. Hearing about Saturday's trip made them envious! Well, that's what we did. They did better than my Saturday's charter on the fishing but the bite was still off. We then motored over to Boca Chita key and had a great cookout of ribs and burgers. Snorkeled and took sun. Week of Aug 25-31,2014 - Had a very nice week with my customers. Had a night trip mid-week that proved to be a decent time despite the windy conditions. We had a nice pick of snappers, yellow-tails and hooked a "look-down" fish. It looks as if it came from out of space. The weekend was great. Saturday - had Rueben and his two beautiful girls on board. I was nervous as this being my first experience with the young girls - ages 5 and 9. We had a great time hooking yellow-tails, mangrove/cubera snappers, small groupers (gags) and hooked into 2 hefty nurse sharks in the twenty lb range. I honored them by making them each girl a queen of yellowtail snappers (the eldest daughter) and a queen of the porgies! Hope see them again! Sunday trip is with one my favorite customers.. Had Joe and his son on board- the menu called for snappers, groupers, and bit of the unknown.. The son hooked up to a beautiful mutton snapper but reeled it in a little too slow- not a good thing..(see the half-eaten mutton) Winds starting blowing from the East NE 15-20mph mid-morning but didn't effect the fish action. 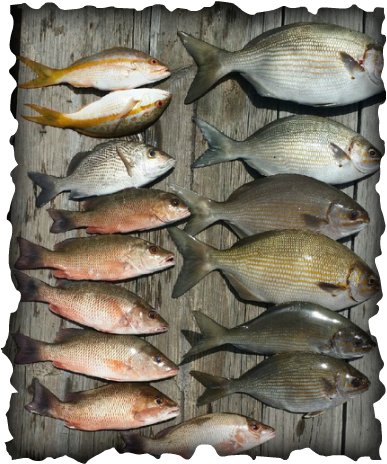 We ended up with 8 snappers (cuberas/mangroves) mixed bag of large grunts, porgies- but no bermuda chubs.. The charter was capped off with the big grouper rod getting slammed from some unknown monster of the deep- pulled my Penn 330 GT reel (equivalent of a 4/0 senator) and peeled 50lb test like it was nothing.. My guessitmate is that it probably was a huge hammerhead shark; its runs were so sharp and precise... But then again.. Only the shadow knows.. Until next time! Tight lines! Weekend of Sept 13-14,2014 - this was a very wierd weekend.. I had planned a night trip with some eager young anglers (Liam and Lola) but Mother Nature had other ideas or so I thought. I cancelled Friday's trip due to the weather report stating that it was going to be a 80% chance of rain.. Well it didn't! So my night trip got pushed to Saturday's night trip. Saturday trip with Lana and Alex was slow- the bite never really took off because the fish didn't know how to react! Not even the grunts were showing up but the bermuda chubs kept us busy. Saturday night trip with Mom, Liam and Lola was also very slow.. I feel real bad that we only hooked some grunts but Liam did managed a nice porgy and missed out on a mean-looking hogfish.. (next time Liam!) but I mentioned to mom that we will set plans again for better conditions. Sunday was looking a little bit better with Tommy, Mercy and lil' (7 year old Cameron). Day was very over-cast and the fish again had lock-jaw.. Tommy hooked small red grouper on a gulp jig (just to show you the type of day it was!) but slow going.. Cameron was the high hook with 5 bermuda chubs... Things should be getting better as the water cools! Tight lines!! 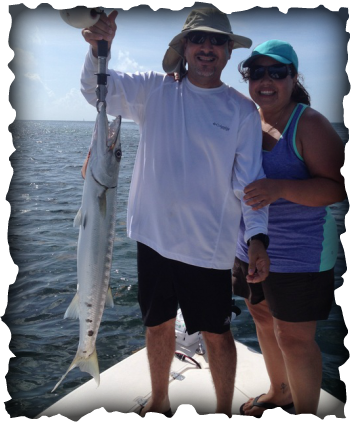 Weekend Sept 27-28,2014 - tough weekend- super hot but nonetheless, we had smiles on our anglers! Check out a nice baracuda John pulled up on a piece of shrimp.. Weekend of Oct 4-5, 2014- This was a great weekend. Saturday's charter was awesome. I had Tadine (great mom! ), her son and 2 friends.. We hit one of my local spots and the action was somewhat consistent but the kids had a great time. We landed a 30lb nurse shark, hit yellow tails and small grunts until the storms started moving in. We then motored over to Boca Chita Key to let the kids unwind..
Sunday was epic!!! Had two nice ladies on board Nicole and Christine. They were up to the challenge. The front moved in over night and we hit snotty conditions in the bay. We hit another spot I thought our fin-friends would be and they didn't disappoint.. What a great day! First time fishing and memories that last for a lifetime-- check out their 2 huge mutton snappers! 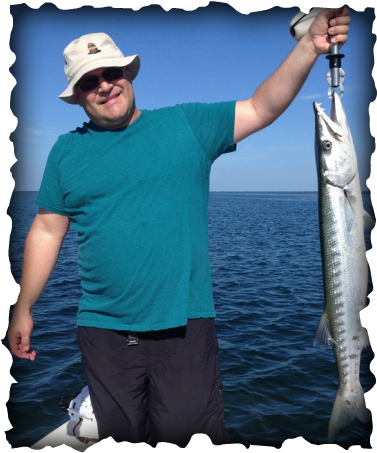 October 16 - 19, 2014- Had a beautiful night charter on Thursday night with Joe and his brother Mike but the fish had other ideas. The tides were hardly moving but the weather was spectacular. Had some action but called it an early night due to lack of movement. Saturday's charter was almost a carry-over from Thursday night's action- mullet schools being chased by tarpon but our target species had lock-jaw. I was out with Chris and his dad (Nicole had to study- good luck) and enjoyed their company. The snapper, grouper and other species just were not in the mood to eat..
Sunday's charter was a break-out day for Patrick and his son!- we had solid action a good part of the morning hitting the yellowtail snapper by storm, mangrove snapppers and Thomas (son) had a nice shark on before he used his defenses to get off the line (ie teeth!) All in all, a very nice time out with them..
October 25-26,2014 - the rain finished up finally last week from the remnants of a tropical storm but had to deal with the power behind it which was cooler and windier conditons. 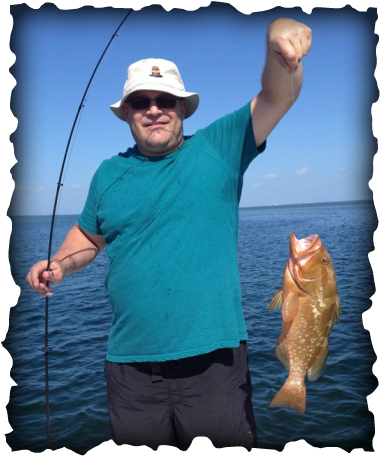 Saturday- went out with Mike and his son- breezy stiff NNW 25ish mph made it a challenge but managed to catch some decent fish- we hooked nice yellow-tail snappers, mangrove snapper but the bite was not too hot. Sunday charter- Had Pat again from last Sunday's charter and his other son. Conditions were not as breezy (still blowing from NNW at 20mph) but the bite never got going. We hooked some yellowtails, grunts but no big takers. Went to other reefs north of Key Biscayne but still nothing really ignited. All in all, it was a good day weekend.. Take care! Weekend of Nov 1 - 2 , 2014 - Very breezy weekend with one of our first "real" cold fronts coming down from the north. Went out Saturday morning with Eric - (we finally hooked up- no cancels this time!) and were blessed with a nice mild morning- no stiff breezed yet! Bait was busting my the channels and hooked some jacks- had a 5-6 foot barracuda that nailed a hooked spanish mackeral- But by 11:45am- someone turned on the fan and we were hitting 30 mph winds.. Sunday's trip was cancelled due to the high winds. November 11,2014--- Happy Veterans Day to all our folks in the armed forces who have paid the ultimate sacrifice for all us Americans! !- Had Robert and his father inlaw Richard out today- started out excellent but the winds turned out a bit nasty.. We hit some yellowtails who have been a no show for at least 2 weeks, mutton snappers and a bunch of huge Rainbow runner jacks up to 3-5 lbs.. Wow! Never seen them that big.. The boys had a nice time out even though the big boys must have taken a day off too.. Nice time and good people on board.. Tight lines all!! November 13,2014- Met up with one of my favorite client's --Joe and his son Bailey (aka Chelsea--long story on the name lol! )- we were targeting a wreck at night. Had a stiff 15-18mph NE wind with an outgoing tide- but a beauty of a sky. Action was a little slow until the tide start to ebb out and nailed a nice Gag grouper, yellowtails, mutton snappers, bermuda chubs, and mangrove snappers. This spot never ceases to amazed me- had live pinfish up top and bottom- no takers from the big boys- but the keeper gag grouper slammed the littlest piece of squid on the smallest rod. Action slowed up, moved a bit by the bridges and the tarpon were just slamming the hapless baitfish.. No takers on our baits.. A great night, good people and ended my night trip season with a bang! Tight lines! 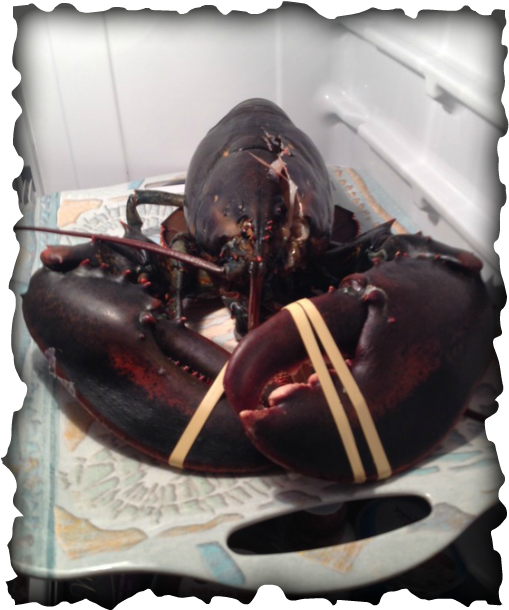 6 lb Maine lobster that didn't make it.. But my opinion, I prefer the Carribean lobster.. still good eating! November 22-23,2014 -all trips cancelled due to unsafe weather conditions. Well folks, that sums up this years trips for 2014. It was a great year meeting great people and look foward to meeting up with them again. I learned a lot from my clients, "mother ocean", and the challenges of chartering. Its a great way to make a living and look foward to 2015 with a full head of steam. Below is a well deserved trip with my wife Nancy who has been patient with my fishing business (and me!) in Islamorada and Key Largo.. Life is too short ! Keep a tight line and don't forget when you hook a fish- yell FISHON!